The Audi S5 with its 4.2-liter eight-cylinder engine and four-wheel drive delivers truly dynamic driving. Enhance this by adding the Akrapovič Slip-On stainless steel exhaust system to increase power, reduce weight, and improve sound. 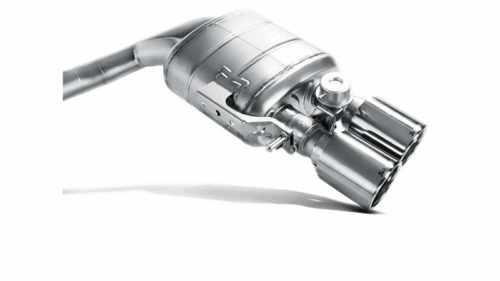 This precision-made Slip-On system delivers more power, especially in the low and mid rev range, and you can take this further with the optional link pipe. 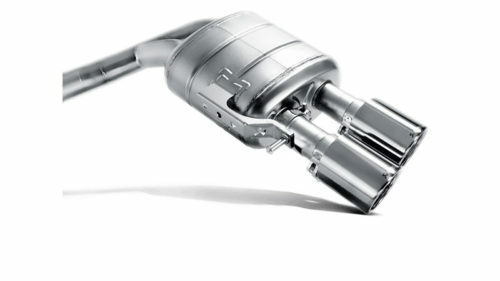 The effect on the sound is significant, adding a deep resonant sporty sound without droning. The Audi S5 with its 4.2-liter eight-cylinder engine and four-wheel drive delivers truly dynamic driving. Enhance this by adding the Akrapovič Slip-On stainless steel exhaust system to increase power, reduce weight, and improve sound. 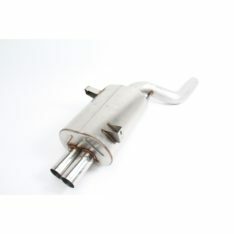 This precision-made Slip-On system delivers more power, especially in the low and mid rev range, and you can take this further with the optional link pipe. The effect on the sound is significant, adding a deep resonant sporty sound without droning. 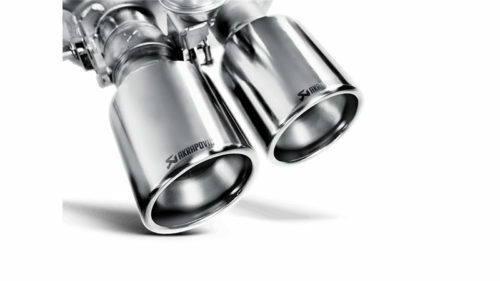 Complete the look with a set of four sporty titanium tailpipes. Select the optional Wireless kit for adjustable sound. 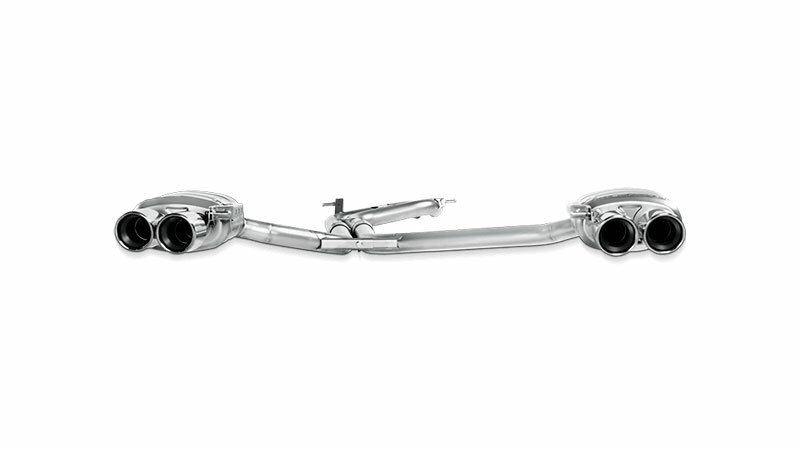 Chose the optional link pipe for even better performance, deeper sound, and weight savings up to 4 kg. Artec Fabrication & Performance nor any of its subsidiaries make any representation that the products comply with the air and/or noise emissions laws, or labeling laws, of any jurisdiction. The purchasers are entirely responsible for informing themselves of the applicable laws where the products are to be used and to comply with those laws. 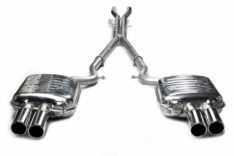 Various U.S. states and the U.S. federal government have individual laws regulating the use of aftermarket exhaust parts and systems, especially as those parts and systems modify, remove, or replace original equipment catalysts. Please consult the appropriate laws in your area before installing any aftermarket part or system on your vehicle to ensure compliance with all applicable laws. Neither Artec Fabrication & Performance nor any of their subsidiaries or the sellers of the parts or systems make any representation that any of their parts or systems comply with any such laws. 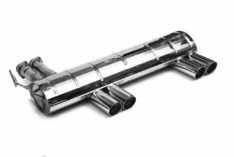 California laws prohibit the use of any aftermarket exhaust part or system that modifies, removes or replaces original equipment catalysts unless the California Air Resources Board (C.A.R.B.) has issued an Executive Order regarding such part or system or unless the part or system is exempted by being used only on racing vehicles on closed courses. 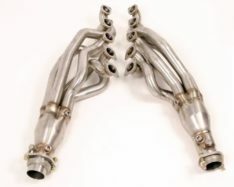 Artec Fabrication & Performance nor any of their subsidiaries make any representation that any of their parts or systems has received such an Executive Order or that any of their parts or systems conform to the racing vehicles exemption. The purchasers are entirely responsible for informing themselves of applicable California laws and to comply with those laws.